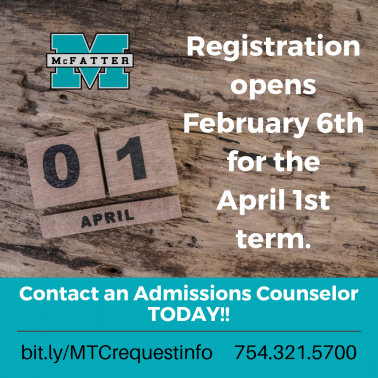 Registration for the April 1, 2019 term of classes will begin on February 6, 2019! Many of our career-technical programs will have a new course starting in April 2019. Please do not wait until the last minute to register. Classes can fill up quickly, and the financial aid process can take a bit of time. CLICK HERE to see how to get started with registration and move forward with the year of the better you! For hours of operation for our Admissions Office, Financial Aid Office, Registrar, and more CLICK HERE. Get started with your FAFSA by CLICKING HERE. Our school code is 030036.